Singapore Repertory Theatre (SRT) has been a personal favourite theatrical group of mine. I’ve watched quite a few of the plays put up or brought in by them. Their children’s plays are particularly enjoyable and of pretty high standard. Although I like the ones brought in by Act 3 and Alliance Français but the inaccessibility of the car parks deters me from attending their plays. During this term, 宝贝’s school did fairy tales with them. 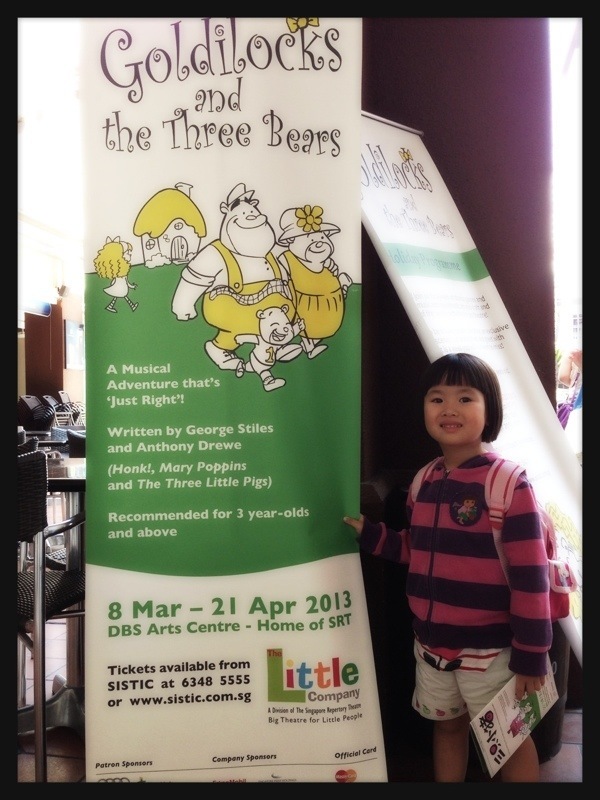 Goldilocks and the 3 bears was one of them. How timely! I bought the tickets way before I knew the theme for this semester. The price of the tickets was reasonable. I’m a pretty cheapskate mom. I wouldn’t pay too much for children’s plays. There were some that I was interested in, during the ACE festival. Alas… The pricey tickets. So, no go lor. The set was beautifully done with movable wooden tree frames and pull out beds and all. In the cozy, colourful country style that I like! And of course, the actors and actresses were first rate. Throughout the whole show, 宝贝 was upset that the bears were going for a walk and Goldilocks would come and eat up baby bear’s porridge. Not to have breakfast is like the end of the world for her. And when Goldilocks’ father couldn’t find her in the woods, her lower lip was quivering when she said in a shaky voice, “Why hasn’t her papa found her?” I was quite amused by her. Bad mama! Laughing at her daughter’s misery. She was genuinely distressed though. Maybe she was putting herself in the shoes of Baby Bear (to have to go without breakfast) and Goldilocks (getting lost in the woods). The only grouse I had was that SRT blocked out the entire middle section of the stall seats for school groups. Only the first 3 rows and last 3 rows were opened to the public for booking. And yet, there were plenty of empty seats. Best seats! What a horrid waste!! Anyway, I would highly recommend Goldilocks and the 3 Bears if you have children. Even as an adult, I found it pretty enjoyable.